Gaming on a laptop has always involved a trade-off between performance and convenience. You could pick up a desktop PC that absolutely crushes the Blade in gaming performance for less, and among laptops, you could get a heavier, uglier beast with better specs and save a few hundred dollars. But some people care about performance and aesthetics. For those gamers, the Blade is the best compromise available. 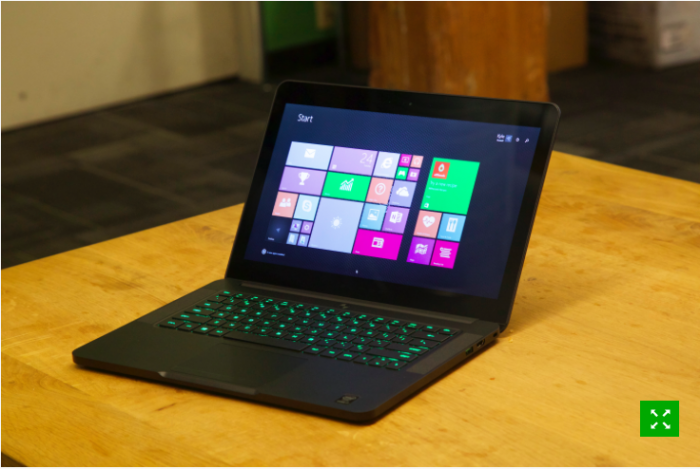 Like its predecessor, this year’s Razer Blade packs in a 14-inch, 3200 x 1800 pixel screen. It looks pretty from most angles and can get quite bright, and has a touch screen if you’re one of the Windows 8 users who actually takes advantage of touch-friendly menus. Photos and video really pop on the display — it’s not quite 4K, but considering it’s already past the point of not being able to discern pixels at reasonable distances, that’s not something anyone is going to miss. Of course, what really matters is whether or not the new Blade can actually handle gaming at decent settings at the panel’s native resolution. The jump up to the Geforce 970M chipset has served the Blade well — I was able to crank graphics up to Ultra on a number of games and maintain 45-60 frames per second, only dipping into settings to turn off anti-aliasing or the highest motion blur settings. Between the new GPU and a mobile Core i7 typically reserved for larger laptops, the Blade is more than just a good gaming machine. If you’re the creative type, it’s also a great device for photo and video editing. Again, that screen really rounds out the package if you’re going to use it for either of these. With the exception of the screen, you could say the same thing about the performance of most gaming laptops, as high-end hardware is a prerequisite for the category. So it’s worth talking about how the Blade manages to stand out in a space where most competitors share the same specs. The case’s aluminum body is aggressive on the outside and classy on the inside. The keyboard, trackpad and speakers are laid out similarly to a MacBook Pro. There’s a comfortable amount of space between keys, and you won’t accidentally hit the power button when you were going for delete. The trackpad is exceptional for a Windows laptop, with gesture support that doesn’t lag or mistake down for up. The left and right mouse buttons below the trackpad don’t provide a very satisfying click, but if you’re gaming on this thing you’ll probably use a separate mouse anyway. While the black aluminum looks great when you take it out of the box, oil from your hands really stands out across the Blade’s surface. It took us a few minutes to scrub down the laptop each time we wanted to take pristine photos, so some may find this annoying. On the part of the outer shell that most people will see, you find two bumps and a bright green Razer logo. If you’re incredibly self-conscious, be aware that it’s going to draw attention among a see of flat surfaces and Apple logos. As with the interior of the laptop, be prepared to see fingerprints on the outside of the Blade in most lighting conditions. On the bottom of the laptop, there are long rubber strips keeping the Blade slightly elevated. That leaves room for the two fans to get hot air away from the hardware. During regular use, the Blade is essentially silent — but crank up the graphics on a game from the last few years, and they can get rather loud. As with the “meh” speakers, I don’t expect many gamers to notice, since the kind of people who buy a $2,200 gaming laptop probably have decent headphones for 3D audio or multiplayer communication.